A fellow Legnano enthusiast in the Netherlands is in the process of restoring an early Tipo Roma cambio corso model and the online conversation turned to the period-correct rims for his project. 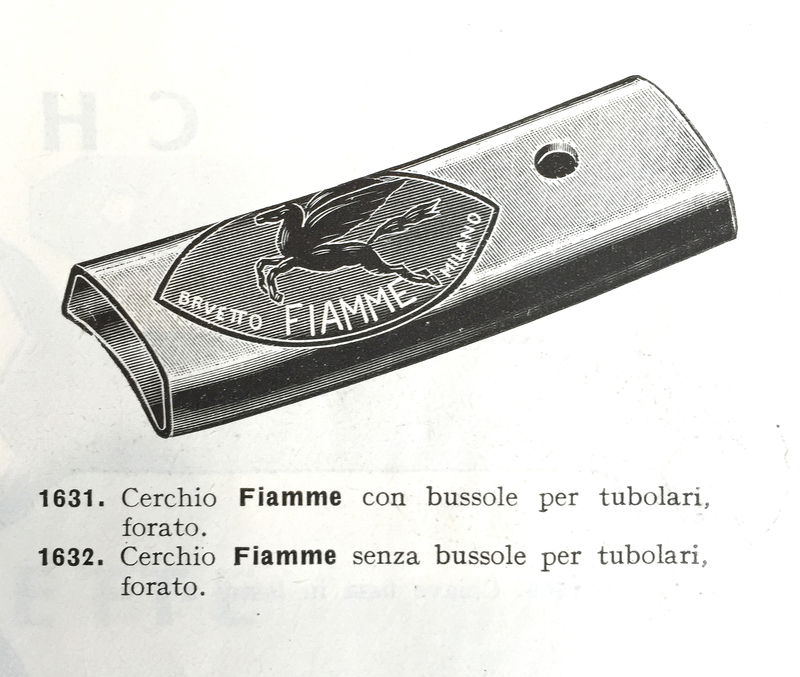 And with that an interest on my part to update the site with some additional background on one of Legnano’s long-standing component suppliers, Fiamme. 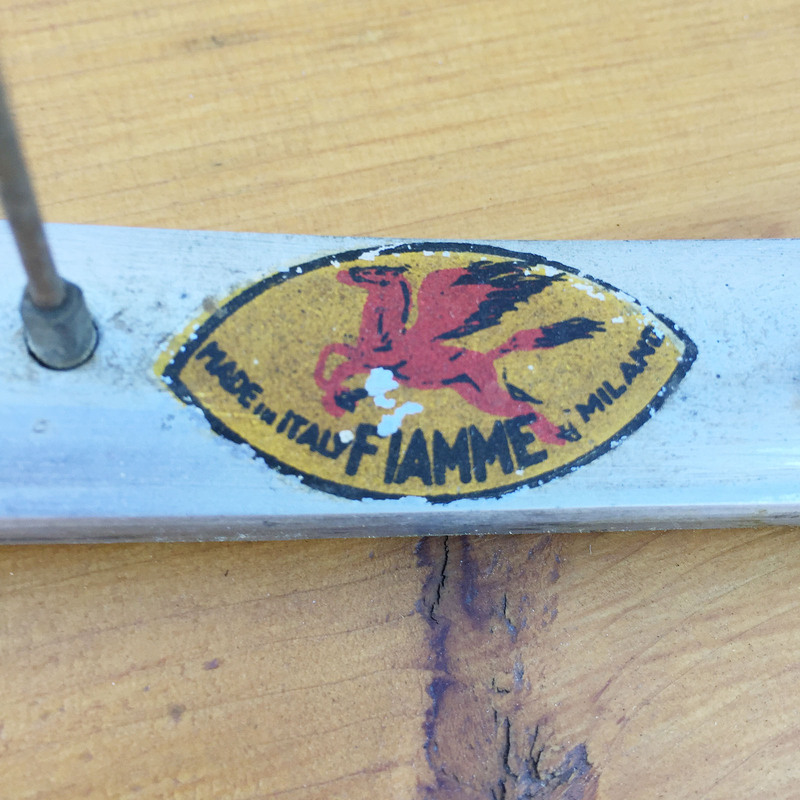 I have yet to find a reference that dates the founding of S.A. Fiamme of Milano, a component maker that is best known for the production of aluminium rims but also produced high-quality stems and handlebars. What is available of Fiamme’s history takes shape in the early 1930’s when Mario Longhi patented the double eyelet, hollow aluminium rim on January 5th, 1934 just two hours prior to a similar patent being filed by Mavic of France (source: Hilary Stone; Mavic). Longhi licensed the patent to Fiamme until its expiration and also to Mavic until 1947 according to the Mavic website. 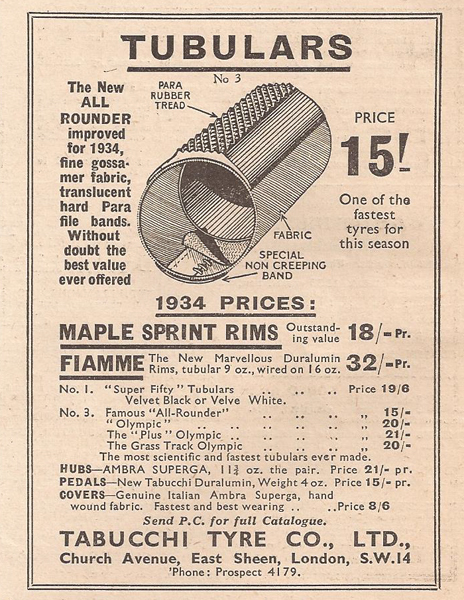 Below is a drawing of the original aluminium Fiamme sprint rim incorporating the Longhi patented construction as illustrated in their 1935 catalog (source: Hilary Stone) and following that an advertisement for the Fiamme sprint rims in the March 2, 1934 issue of Cycling magazine (source: Classic Lightweights UK). The first image below is from the extensive 1952 Emilio Bozzi SpA parts catalog, offering the Fiamme tubular rim with and without eyelets. Note the Fiamme logo incorporates an image of Pegasus, the mythological winged horse, as opposed to the illustration of a helmet that we are most familiar with. Also the label is in the shape of a ‘marquis’ rather than an oval. I have yet to come across a tubular type rim with the Pegasus illustration on the label. 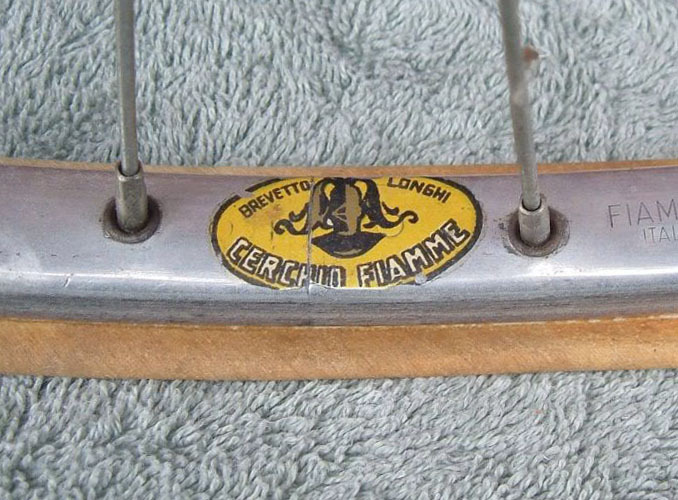 The second image below is the Fiamme rim with eyelets on the 1946 Legnano Tipo Roma in my collection. The ‘Brevetto Longhi’ license stamped above the ‘S.A. Fiamme’ branding can also be found in the identical format on my original 1958 Roma and my 1963 Roma. 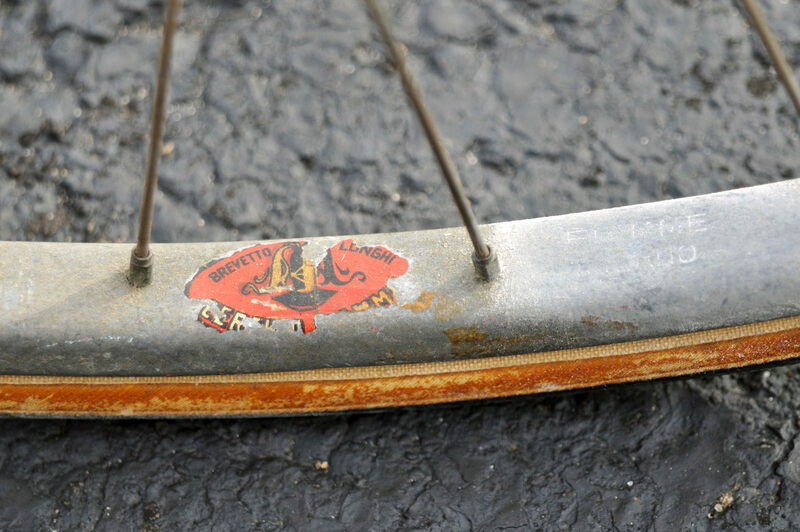 However, the Fiamme rims (with eyelets) on my original 1966 Roma are simply stamped ‘S.A. Fiamme’ with ‘Made in Italy’ below, suggesting that the Longhi patent had expired by that time. I should also mention that the valve hole on all of the above rims has a reinforcing eyelet. The third image below is courtesy of a post on Bike Forums by ‘iab’ who references it to a 1948-1949 Viscontea Pista. 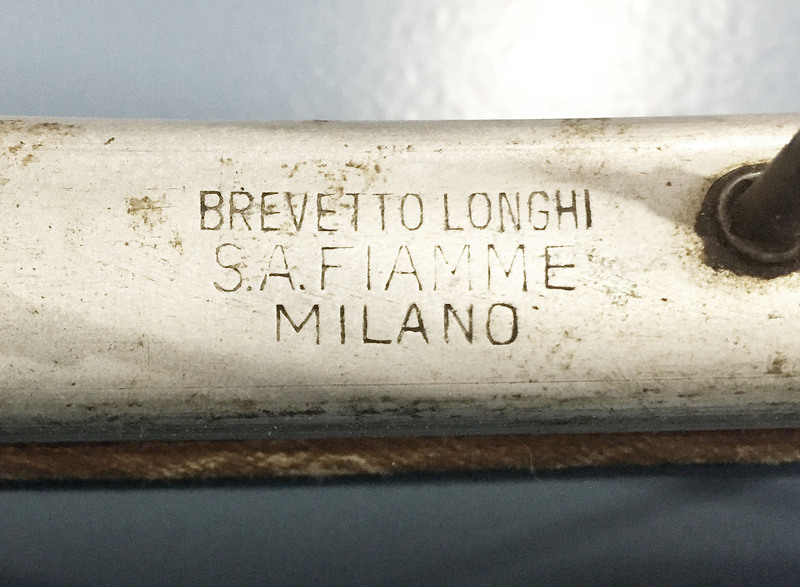 What is notable is this early Fiamme red label rim is without the reinforcing spoke eyelets and is simply engraved ‘Fiamme Milano’, and without the words ‘Brevetto Longhi’ as the rim does not make use of the Longhi patent. I am limiting this review to pre-1970 production however Fiamme went on to produce rims well into the 1980’s. Unfortunately like so many dominant Italian component manufacturers that got their start in the 1920s and 1930s, changing European trade laws along with the Japanese invasion of lucrative foreign markets may have proved too much for Fiamme and they went out of business. It is reported that Fiamme’s assets were purchased by FIR of Italy (Fabbrica Italiana Ruote). 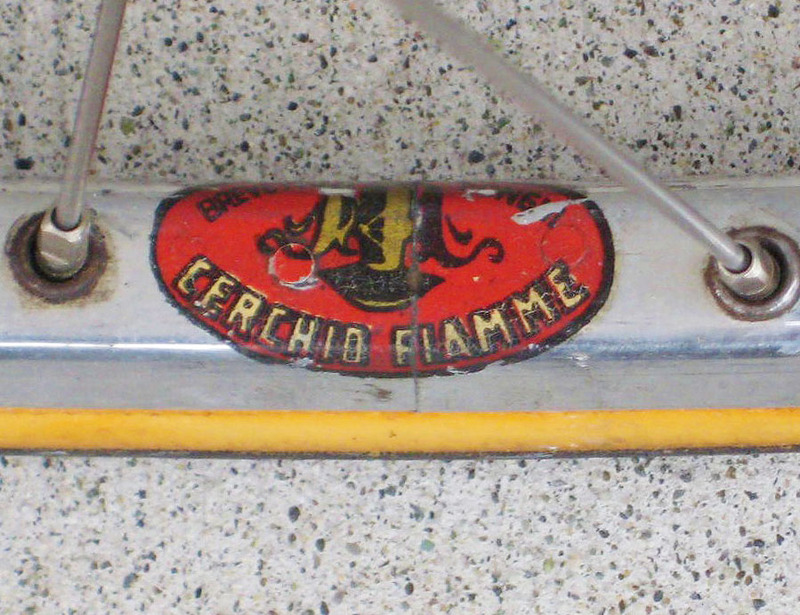 Prior to 1970 I have come across Fiamme tubular rims with four different label types in three colours. The first image below is the red label Fiamme pista rims fitted to a 1952 Fiorelli track bike that is featured on on the Classic Cycle website. The red label rims were also produced in a road profile, widely used and highly rated from all accounts I have come across. The yellow label rims (oval shape label) were of a lighter weight (approx. 50-60g) and were also available in both road (second image below) and pista profiles for special events, time trials and/or lighter riders. 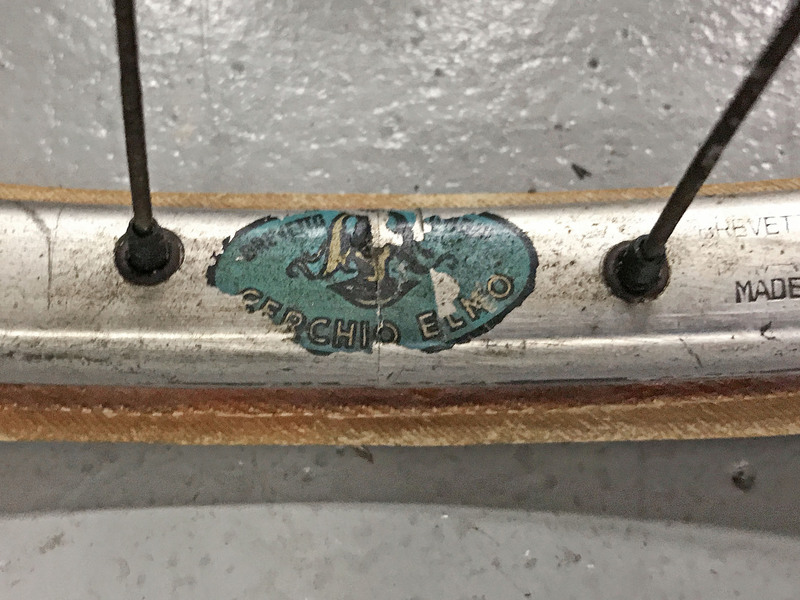 Although I have yet to verify this statement, online comments would suggest that the green label rim marked ‘Cerchio Elmo’ rather than ‘Cerchio Fiamme’ was a heavier or more robust rim than the red label rim. The green label rims are factory spec on many of the Legnano Roma and Gran Premio models in my collection dating back to 1958. As most of these same bikes in my collection are imports to North America, the more robust green label Fiamme rim may have been in response to the mixed road conditions in NA at that time. It is interesting that the word ‘elmo’ in Italian translates to ‘helmet’ in English, derived perhaps from the illustration of a helmet in the Fiamme logo. Not to be missed, Fiamme also produced aluminium clincher rims that were designated with a yellow marquise-shaped label with the resurrected Pegasus logo as discussed earlier. The image below is of a 27 inch clincher rim (with Schrader valve holes) original to the 1961 Gran Premio on this site, a Legnano import to the United States with clincher tires and Schrader valves that could be ‘pumped up’ at any local gas station. Online reports suggest these Fiamme clincher rims were in production until approx. 1975. The third image below is from the 11th Edition in 1974 of Gene Portuesi’s ‘Cyclopedia’ catalog (source). 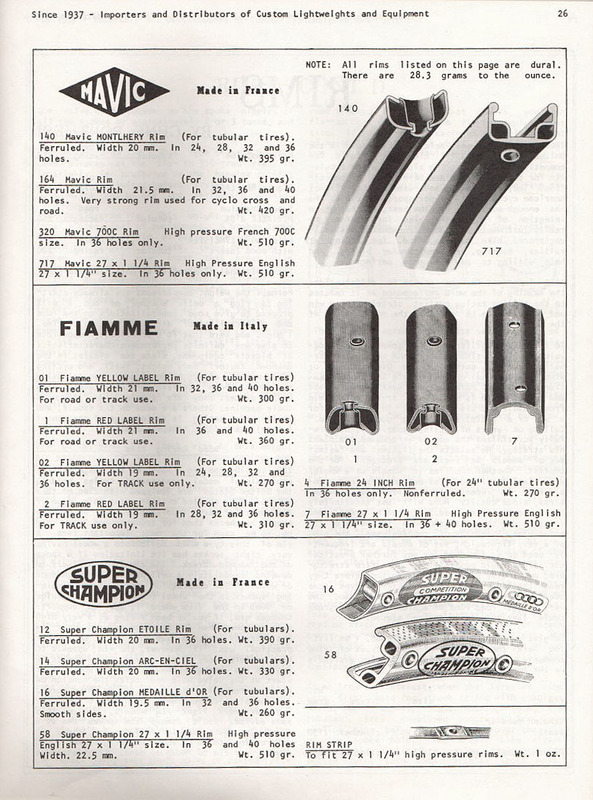 Given print production practices at the time, I suspect the Fiamme illustrations were produced much earlier than 1974 and carried over from one catalog to the next as bicycle components did not change up on a yearly basis as they do today. 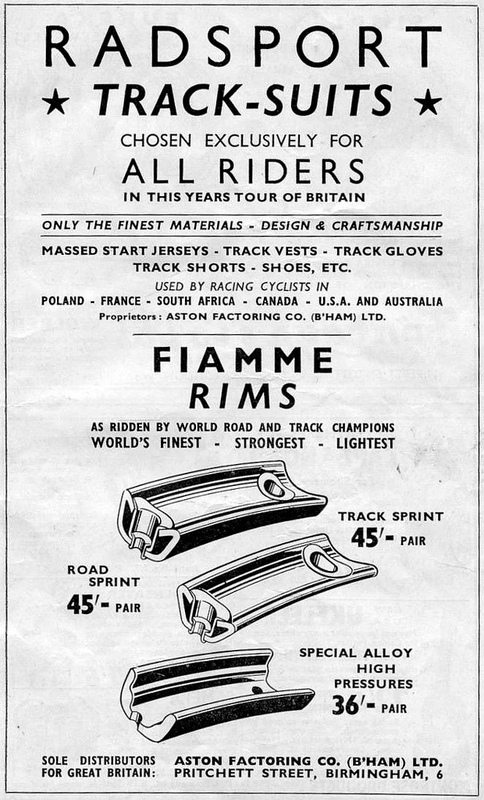 And to conclude this post and as initially mentioned, Fiamme also produced a fine line of aluminium handlebars and stems. 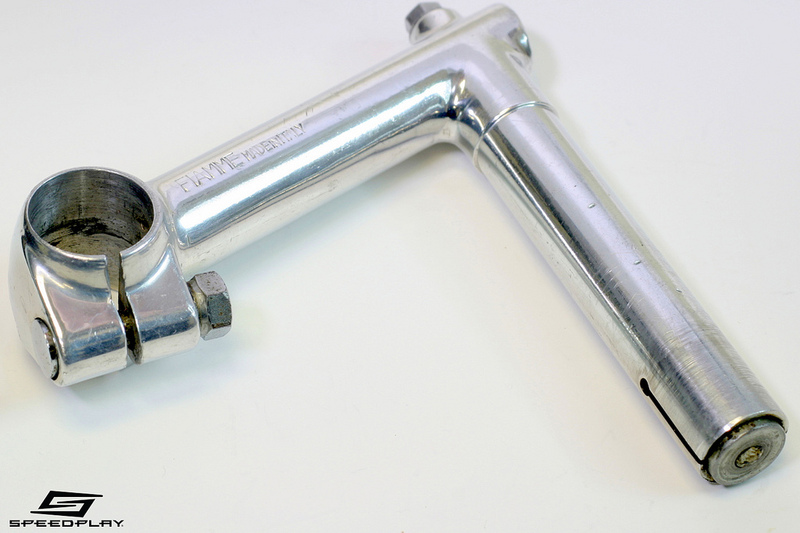 I am estimating the stem in the image below (courtesy of Speedplay) was produced in the late 50’s to early 60’s based on the exposed detailing of the binder bolt and overall design which is very similar to the stems from Ambrosio during those same years, another favoured supplier of stems and bars that were widely used by Legnano on the Roma and Gran Premio models. But we will keep Ambrosio for another post. This entry was posted in Fiamme, Gran Premio, Legnano components, Roma Olimpiade and tagged Emilio Bozzi, Fiamme, Legnano, Roma Olimpiade, Tipo Roma. Bookmark the permalink. What a fantastic site and resource! I have a beautiful 1976 Specialissima, which came with Fiamme tubular rims and Campy Record hubs. I’m looking to purchase a set of clincher rims for a long tour and wanted to check which rims would period-correct. Your advice greatly appreciated. Thanks for writing. Since the Specialissima was not available with 700c clincher rims, I would not bother attempting the period-correct route with clinchers as there are not a lot of rim options and they are not ‘high pressure’ in the modern meaning of the term. 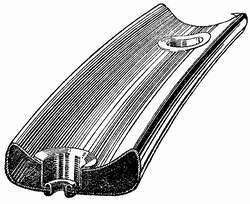 The clincher tires at this time were also ‘wire bead’ format and options here are also limited. Both are traditional polished aluminium, box-style rim profiles that are very similar in appearance to a vintage tubular rim. They will also enable you to use modern 700C tires which is the real advantage. Here I would use the tan sidewall tires with extra light casings that are distributed by Compass Cycle. Either the 32mm Stampede Pass or the 35mm Bon Jon Pass depending on the frame clearance of your Specialissima. In fact, you could consider sourcing/buying another set of Campy hubs of the same type and general timeframe that are fitted to your Specialissima. That way you will still have this Legnano 100% original should you ever decide to sell it down the road? Something to consider. Thanks so much for your detailed reply. It’s much appreciated. I tried finding a set of Velo Orange, but ended up buying an old pair of Mavic Module E rims with Campy Record hubs and have fitted them with 27×1 tan wall Panaracer clincher tyres. Not ‘tutto Italiano’ I know, but at least the wheels have Record hubs and period correct rims. I need to darken your door once more. My Specialissima was sold to me as a 1976 model, but I have a feeing it might be earlier. If you don’t mind I’ll send you photos via a separate email and would appreciate your evaluation? Sounds like the project is going well. Happy to look at the photos and pass along what I can on the production year. Am trying to send you a few photos, but can’t seem to paste them in the body of this message. How do you attach photos please? Here are photos of my Olimpiade Record Specialissima, which I bought a few years ago. I’d be hugely grateful if you could have a look and let me know what the production year is. It was sold to me as a 1976 model and all the components fit that period. However, I think the inside frame seat bolt suggests it’s a bit older. Is it possible that the frame sat in the factory for a few years before being assembled with the components in 1976? The Nuovo Record rear derailleur patent is 76. I’ve recently swapped the original wheels for a set of Mavic clinchers for a long ride I’m doing next month. The original wheels were Fiamme sprint rims (red rectangle decal) with Record hubs and Regina Oro freewheel. Regrettably you can not attach files to comments. Please email the images to info@condorino.com and I will do my best to sort the date of this Legnano for you.